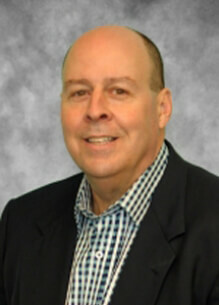 Dan Richards - Keating & Associates, Inc.
Nearly 30 years ago, Dan joined Keating & Associates to lead IT operations. A few years later he began supporting internal accounting and today, Dan serves as the Chief Financial Officer. The Keating staff and advisors are Dan’s clients and he says his favorite part about his job is the relationships he’s been able to build. He describes the company as all relational and maintains it wouldn’t be what it is today without this foundation. Dan appreciates the opportunity to provide solutions and growth opportunities to the team; and he appreciates the autonomous culture that continues to attract and retain talented advisors and staff. A lifelong resident of Manhattan, Dan and his wife Mitzi enjoy time hosting gatherings with their three sons, wives, five grandchildren (so far) and black Labrador Retriever, Rey. Pairing Sunday dinners with Dan’s extensive wine collection and watching K-State sports and movies in their garden ‘couple cave’ continues to keep their family close. It’s been very rewarding to observe tenured advisors mentor and collaborate with the young advisors. Their shared success creates a strong company culture and a climate that promotes client satisfaction, growth and organic leadership succession. The shift is dynamic and it’s powerful. Our Advisors are here for you. If you ever have any questions about wealth management or financial planning, contact us, we are here to give you solutions. For general inquiries or more information, visit the Contact page. Click a location below to contact a specific office. Consulting and Financial Planning Services offered through Keating Financial Advisory Services, Inc. Keating & Associates and Keating Financial Advisory Services, Inc. are not registered broker/dealers and are independent of Raymond James Financial Services. Investment Advisory Services are offered through Keating & Associates, Inc. and Raymond James Financial Services Advisors, Inc.
Securities are offered through Raymond James Financial Services, Inc. Member FINRA/SIPC. © 2017-2019 Keating & Associates, Inc.
You are leaving the Keating & Associates website. Raymond James is not affiliated with and does not endorse, authorize or sponsor any of the listed websites or their respective sponsors. Raymond James is not responsible for the content of any website or the collection or use of information regarding any website's users and/or members.